The Supermarine Spitfire was the most well-known of the World War II era fighter aircraft but by the late 1940’s was quickly become obsolete. In October 1948, 14 ex-RAAF Spitfires were transferred, by truck, to the RAN and delivered to the Naval Air Station – Nowra (NAS –Nowra). A dummy deck was marked out at the air station to simulate the size and space of HMAS Sydney’s flight deck and these aircraft were used as deck handling aids for training RAN flight deck personnel in the correct procedures for moving aircraft around a busy flight deck at sea. This enabled the flight deck crews to learn their trade ashore with real aircraft before being sent to sea. Aviation mechanics would run the engines for practice and also taxi the aircraft around the dummy deck. This gave the aircraft handlers and others a chance to experience the problems and dangers of working close to aircraft with noisy engines and spinning propellers. 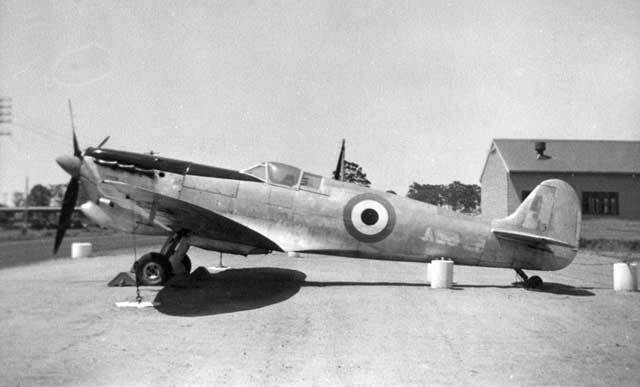 None of the Spitfires were air-worthy and were only maintained to ground run status. In 1952 the aircraft were no longer required and later transferred to the NAS Nowra fire ground where they were used for training flight deck crews in extinguishing aircraft fires. The remains were reported to have been buried at Nowra. Left: A Spitfire being marshalled on the dummy deck at the Naval Air Station - Nowra. Right: A Spitfire at the Nowra fire ground in the early 1950's before being used for fire-fighting training.